3-Frank Edmund Richardson was born on 15 Nov 1876 in Westbury, Tasmania, died on 7 Sep 1936 at age 59, and was buried in Methodist Church, Hagley. Frank married Ida May French, daughter of Rowland Robert French and Annie Elizabeth Briggs, on 11 Dec 1912. Ida was born on 10 Jan 1891 in Westbury, Tasmania and died on 13 Feb 1971 in Westbury, Tasmania at age 80. 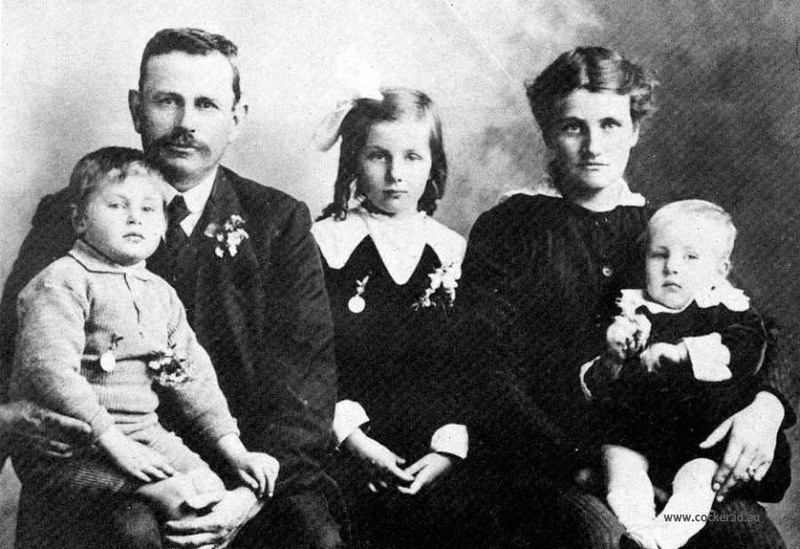 Frank was born on 15th November, 1876, the third son of Isaac and Mary Ann Richardson. He spent his boyhood at Paddy's Scrub at Osmaston and attended school until he reached the fourth class. Frank spent a lot of time helping his father clear the land and erect fences and learnt building and blacksmithing, which he became very good at. The only time he ever had a brush with the law was when at 17, he rode his pushbike on the footpath at Westbury to avoid a rough patch of road. A policeman saw him and he was taken to court and received a fine, which he felt he didn't deserve as there was no-one else on the footpath at the time. Soon after Frank and Henry left Paddy's Scrub they brought a bush farm at Selbourne. When the brothers decided to marry Frank bought Henry's share. With his six bullocks he shifted the house, room by room, down the road one mile nearer Selbourne and called it "Glenburn". Frank married Ida May French of Hagley on 11th December, 1912. They had five children — Ila, Vivian, Roy, Athol and Eric. Frank, as a boy, attended Sunday School when his grandfather, Michael Walker was superintendent and his father was secretary and also a teacher. This was the Exton Methodist Church which had been built by his grandfather and father. During his lifetime he held many offices in the Methodist churches at Exton, Hagley, Selbourne and Butleigh Hill. All his life he lived strictly to what he believed, leaving his own work to help a neighbour. There were many snakes around Selbourne and Frank used to pull a young wattle, trim the roots for a handle and waddy, therefore being always ready for snakes. When he left Selbourne his neighbours gave him a proper walking stick which he treasured until his death. In 1921 while helping to build the Selbourne Methodist church, Frank suffered two sunstrokes which badly affected his health and by 1927 he began looking for a better farm. In March 1929, a few days before the big flood, he with his wife and family had moved to a smaller more level farm on the Green Rises Road near Cressy. He suffered a lot of ill health during the last few years of his life and died on September 7th, 1936 and was buried in the Hagley Methodist cemetery. 4-Ila May Richardson was born on 25 Sep 1913 in Hagley, Tasmania. Ila married Norman Henry Greig, son of Henry Greig and Mary Craig. Norman was born on 27 Jun 1908 in Perth. They had three children: Wesley Allan, Ronald Henry and Lexie May. 5-Wesley Allan Greig was born on 3 Feb 1942. Wesley married Jume Allison Hayes. Jume was born on 11 Sep 1949. They had four children: Kathryn Alison, Maree Alison, Linday Alison and Rebecca Alison. 6-Kathryn Alison Greig was born on 10 Sep 1969. 6-Maree Alison Greig was born on 7 Sep 1971. 6-Linday Alison Greig was born on 4 Aug 1974. 6-Rebecca Alison Greig was born on 7 Jul 1982. 5-Ronald Henry Greig was born on 9 Dec 1946. Ronald married Jennifer Frances How. Jennifer was born on 16 Jan 1947. They had three children: Mandy, Jacklyn Jennifer and Daniel. 6-Mandy Greig was born on 1 Jul 1967. 6-Jacklyn Jennifer Greig was born on 13 Nov 1975. 6-Daniel Greig was born on 11 Jul 1979. 5-Lexie May Greig was born on 23 Jun 1949. Lexie married Maurice William Webb. Maurice was born on 25 Jun 1948. They had two children: Matthew William and Tina Louise. 6-Matthew William Webb was born on 25 Feb 1973. 6-Tina Louise Webb was born on 8 Dec 1974. 4-Vivian Frank Richardson was born on 1 Apr 1916 in Hagley, Tasmania, died on 17 Oct 2005 in Ulverstone, Tasmania at age 89, and was buried on 19 Oct 2005 in Lawn Cemetery, Ulverstone, Tasmania. Vivian married Rhoda Ellen Page, daughter of John Thomas Page and Rose Alice Rebecca McGiveron, on 28 May 1941 in Methodist Church, Bracknell. Rhoda was born on 23 Sep 1918 in Upper Liffey, Tasmania, died on 7 Aug 2008 in Home, Lovett Street, Ulverstone, Tasmania at age 89, and was buried on 7 Oct 2008 in Central Lawn Cemetery, Ulverstone, Tasmania. They had five children: Hazel May, Stanley Vivian, Maxwell Douglas, Raynor Leslie and Alan John. 5-Hazel May Richardson was born on 9 Mar 1942 in Longford, Tasmania. Hazel married Neville Frank Hingston on 6 Apr 1963 in North Motton. Neville was born on 7 May 1940 in Ulverstone, Tasmania. They had four children: Susan May, Leanne Rose, Wendy Jane and Linda Joy. 6-Susan May Hingston was born on 14 May 1965. Susan married Morris John Lovell on 19 Nov 1988 in Devonport. Morris was born on 9 Apr 1959 in Carlton, Melbourne, Victoria. They had four children: Kristy Sharee, Andrew John, Rebecca Alice and Deanna May. 7-Kristy Sharee Lovell was born on 7 Jul 1984 in Ulverstone, Tasmania. 7-Andrew John Lovell was born on 17 Jul 1986 in Ulverstone, Tasmania. 7-Rebecca Alice Lovell was born on 17 Apr 1988 in Ulverstone, Tasmania. 7-Deanna May Lovell was born on 6 Jul 1989 in Devonport. 6-Leanne Rose Hingston was born on 3 Oct 1966 in Ulverstone, Tasmania. Leanne married Phillip Hugh McKenna on 6 Feb 1988 in Ulverstone, Tasmania. Phillip was born on 9 Jan 1965 in Ulverstone, Tasmania. They had four children: Ashlee Laura, Jayden Philip Hugh, Haylee Rose and Erin Lee. 7-Ashlee Laura McKenna was born on 4 Feb 1991 in Kalgoorlie, Western Australia. 7-Jayden Philip Hugh McKenna was born on 22 Feb 1993 in Kalgoorlie, Western Australia. 7-Haylee Rose McKenna was born on 10 Jan 1995 in Kalgoorlie, Western Australia. 7-Erin Lee McKenna was born on 19 Jun 1996 in Kalgoorlie, Western Australia. 6-Wendy Jane Hingston was born on 11 Feb 1969 in Ulverstone, Tasmania. Wendy married Jeremy Edward Meadowcroft on an unknown date in Hobart, Tasmania. Jeremy was born on 1 Jan 1970. They had two children: Natalie Jane and Racheal Louise. 7-Natalie Jane Meadowcroft was born on 1 May 1996 in Hobart, Tasmania. 7-Racheal Louise Meadowcroft was born on 25 Mar 1998 in Hobart, Tasmania. 6-Linda Joy Hingston was born on 19 Oct 1975 in Ulverstone, Tasmania. Linda married Damian Jacob Knaap on 2 Jan 1999 in Tasmania. Damian was born on 19 May 1975 in Ulverstone, Tasmania. They had two children: Adam Michael and Chantelle. 7-Adam Michael Knaap was born on 24 Feb 2000 in Latrobe. 7-Chantelle Knaap was born in 2003. 5-Stanley Vivian Richardson was born on 6 Mar 1943 in Launceston. Stanley married Celia Ann Tape on 22 May 1965 in Berri, South Australia. Celia was born on 28 Jul 1945 in Berri, South Australia. They had four children: Ian James, Garry Brian, Julie Ann and Nigel John. 6-Ian James Richardson was born on 19 Jul 1967 in Berri, South Australia. Ian married Teena Jane Gabel on 24 Jun 1989 in Bicheno, Tasmania. Teena was born on 14 Aug 1962 in Launceston. They had two children: Vernetta Jessie and Karla Jane. 7-Vernetta Jessie Richardson was born on 1 Aug 1993 in Launceston. 7-Karla Jane Richardson was born on 22 Aug 1995 in Launceston. 6-Garry Brian Richardson was born on 10 Jan 1970 in Devonport. Garry married Leesa Jan Mc Gurk on 8 Jan 1994 in Bracknell, Tasmania. Leesa was born on 29 Jun 1972. They had three children: Bradlee Darren, Meegan Jessica and Haemish James. 7-Bradlee Darren Richardson was born on 12 Apr 1995 in Launceston. 7-Meegan Jessica Richardson was born on 20 Dec 1997 in Launceston. 7-Haemish James Richardson was born on 20 Mar 1998 in Launceston. 6-Julie Ann Richardson was born on 11 May 1972 in Devonport. Julie married Darren Justin Reeves on 18 May 1996 in Ulverstone, Tasmania. Darren was born on 14 May 1974 in Devonport. They had one daughter: Calissa Ann. 7-Calissa Ann Reeves was born on 12 Aug 1999 in Latrobe. 6-Nigel John Richardson was born on 19 May 1977 in Devonport. 5-Maxwell Douglas Richardson was born on 8 May 1944 in Launceston. Maxwell married Heather Muriel Viney on 6 Apr 1968 in North Motton. Heather was born on 28 Jan 1951 in Ulverstone, Tasmania. They had four children: Lisa Grace, Fiona Louise, Kathrina Anne and Glen Andrew. 6-Lisa Grace Richardson was born on 7 Dec 1970 in Ulverstone, Tasmania. Lisa married Stephen Piper on 26 Aug 1994 in Ulverstone, Tasmania. Stephen was born on 28 May 1970. They had two children: Charlotte Grace and Aiden Stanley. 7-Charlotte Grace Piper was born on 25 Feb 1998 in Burnie, Tasmania. 7-Aiden Stanley Piper was born on 3 Mar 2000 in Burnie, Tasmania. 6-Fiona Louise Richardson was born on 5 May 1972 in Ulverstone, Tasmania. Fiona married Peter Hingston on 21 Jul 1990 in Ulverstone, Tasmania. Peter was born on 28 Sep 1965. They had four children: Emma Louise, Joanna Michelle, Miriam Paula and Sarah Georgia Rose. 7-Emma Louise Hingston was born on 18 Aug 1991 in Burnie, Tasmania. 7-Joanna Michelle Hingston was born on 4 Jan 1994 in Burnie, Tasmania. 7-Miriam Paula Hingston was born on 14 Aug 1995 in Burnie, Tasmania. 7-Sarah Georgia Rose Hingston was born on 1 Jul 1997 in Burnie, Tasmania. 6-Kathrina Anne Richardson was born on 20 Dec 1974 in Ulverstone, Tasmania. Kathrina married Andrew Squibb on 4 Apr 1999 in Melrose. Andrew was born on 18 Nov 1966. They had one son: Bryce John. 7-Bryce John Squibb was born on 14 Nov 2001 in Latrobe. 6-Glen Andrew Richardson was born on 12 Dec 1978 in Ulverstone, Tasmania. 5-Raynor Leslie Richardson was born on 29 Sep 1945 in Launceston and died on 6 Mar 1971 in Ulverstone, Tasmania at age 25. 5-Alan John Richardson was born on 21 Feb 1950 in Launceston. Alan married Patricia Ann Mace in 1972 in Ulverstone, Tasmania. Patricia was born on 15 Nov 1954. They had three children: James Laurence, Carl John and Keryn Evelyn. 6-James Laurence Richardson was born on 17 Sep 1972 in Ulverstone, Tasmania. James married Paula Jane Smith on 10 Feb 1996 in Penguin. Paula was born on 19 Nov 1974 in Launceston. They had one daughter: Letitia Ruth. 7-Letitia Ruth Richardson was born on 15 Oct 2000 in Latrobe. 6-Carl John Richardson was born on 12 Sep 1974 in Ulverstone, Tasmania. Carl married Rebecca Vicki Badcock. They had one daughter: Georgia Evelyn. 7-Georgia Evelyn Richardson was born on 14 Oct 1998 in Latrobe. 7-Myron John Richardson was born on 18 Feb 1994 in Mornington, Victoria. 7-Bernadette Anne Richardson was born on 13 Aug 1995 in Latrobe. 6-Keryn Evelyn Richardson was born on 30 Oct 1978 in Tasmania. 4-Roy Roland Richardson was born on 5 May 1918 in Hagley, Tasmania and died on 22 Jul 1927 in the Launceston General Hospital at age 9. 4-Athol Frederick Richardson was born on 20 Apr 1924, died on 24 Sep 2008 at age 84, and was buried on 29 Sep 2008 in Lawn Cemetery, Longford, Tasmania. 4-Eric Walter Richardson was born on 16 May 1928. Eric married Lorna Elizabeth Gibson. Lorna was born on 14 Sep 1935. They had two children: Carol Joy and Brian Walter. 5-Carol Joy Richardson was born on 31 May 1965. Carol married Richard Prewer. They had one daughter: Abigail Melanie. 6-Abigail Melanie Prewer was born on 29 Mar 1988. 5-Brian Walter Richardson was born on 23 Nov 1967.